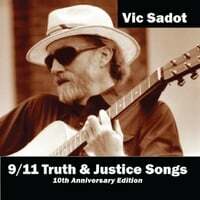 “9/11 Truth & Justice Songs” at CD Baby has 16 songs that relate to the many remaining questions about those horrific events of “shock and awe” and the official conspiracy story that was told about 19 Muslims with box cutters led by a man on a dialysis machine coordinating the massive attacks from a cave. The massive failure of the billion dollar US military and intelligence establishment led to no normal criminal type of investigation in which the means, motive, and opportunity and who benefited were essential questions. There were also no firings, court-martials, or demotions for those deadly failures. Instead the events of 9/11 were used to promote new wars and repressive laws. Vic’s songs engage these matters with humor and with respect for the laws of physics and the US Constitution.